Some pilots don’t have to work very hard. Even if you don’t know that Haven, a new show on SyFy, is based on a book by Stephen King, you’ll likely figure it out pretty fast. A lone cop is sent to a small Maine town filled with colorful characters where something of a vaguely sinister super-nature is going on. Other things we already know: FBI agents and local police officers don’t get along. Female cops work super hard and don’t have time for dating. People who live on boats are odd. So, putting all of those givens into place, let’s get to know Agent Audrey Parker (Emily Rose). A quick couple of aerial shots show us she lives in a big city. Her boss shows up with an assignment, pausing to comment on a teen vampire novel on her table. “FBI is nonfiction work,” he pontificates. Huh? Agent Parker gets to Haven, a small harbor town with exceedingly strange weather. 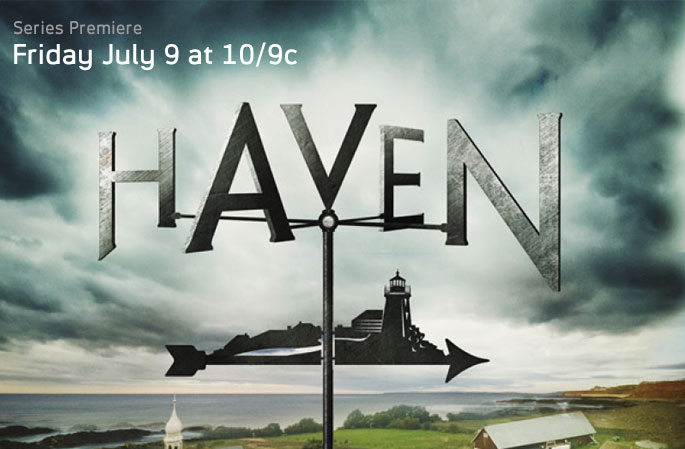 You know when a town on TV has a quaint, cozy-sounding name like Haven, bad things are going to happen there. (Point Pleasant, Wisteria Lane.) She’s driving along when a chasm opens in the road in front of her, forcing her through a guardrail. We never get an explanation for that. It’s funny though, when her car is hanging half-way off a cliff, that she takes the time to turn off the radio so she doesn’t have to die to an annoying 70s song. Her first confrontation with local cop—and soon-to-be love interest, no doubt—is likewise pretty amusing. The show succeeds with witty dialogue more so than in other areas. There are some truly funny moments. The banter between the cop, Nathan, and Audrey is delivered with the requisite cynicism. The jokes kind of pop up out of nowhere, making them the one element of the unexpected in a show that is supposed to be suspenseful. The reason Audrey is in Haven is forgettable in light of everything that ends up happening, but she’s supposed to locate an escaped convict. The problem is, he’s already dead. Like a good television FBI agent in heels, she doesn’t let that deter her. She starts nosing around the town, meeting its various denizens. The stand-out for creep of the year is a handyman named Conrad with “personal space issues.” Whenever this guy gets pissed off there’s bad weather. You would think every school kid in town would be vandalizing his house hoping for a snow day. Spoiler alter. It turns out, though, that it’s not really him that’s affecting the weather. It’s the pretty antique store owner who he hangs around. Audrey wraps this one up nice and neat, so possibly each episode will revolve around a different resident with a bizarre power. The A plot is that Audrey is an orphan (paging Temperance Brennan) and there is an old photo in the town newspaper of a woman that looks just like her. A quick scene of Audrey’s boss at the FBI having a cryptic phone conversation reveals that she was sent to Haven for a reason we’ve yet to discover. This pilot is so pilot-y it’s just boring. It could have had a later point of attack and possibly been much more interesting. I for one, probably won’t continue watching to see what becomes of Audrey. This entry was posted in 2010s, Dramas and tagged cop show, haven, rose, stephen king, syfy by meekthegeek. Bookmark the permalink.